31 Hence that place was called Be’er Sheva, for there the two of them swore an oath. Avraham names the place where he entered the covenant with Abimelech Be’er Sheva. The name Be’er Sheva (באר שבע), is made up of two Hebrew words. 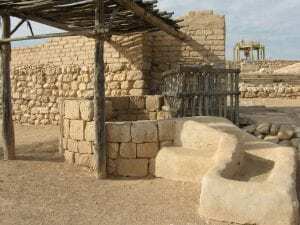 Be’er (באר) means ‘well,’ hinting to the fact that this covenant acknowledged Avraham’s right to the water well. The second part of the word is made up of the root ש-ב-ע, which means both ‘seven’ and ‘oath.’ Thus, Be’er Sheva can mean either ‘well of the seven’ or ‘well of the oath.’ This double meaning hints both to the seven female sheep set aside by Avraham as verification of the oath, and to the oath taken with regard to the well itself. I also appreciate that. I did not know it meant oath either. With seven meaning spiritual completeness that helps me understand the seven ewe's. This would then be land, undisputed, where Abraham planted a grove and there called on the name of the Lord, the everlasting God, Yahweh, El Olam, and remained there many days! Maybe could/ should be the very beginning of the Great Nation of Israel that Abraham's descendants would begin with Joshua. That is very interesting, I did not know that sheva also meant oath. I shall keep that, thank you.